What is green procurement anyway? Well, we think that we all define it personally. Here is a passage from an article that provides an interesting look on green procurement. "While green procurement is obviously a worthwhile goal, figuring out which product is greener than another and by how much can feel like you're working your way through a hedge maze and be just as time-consuming. But you can use the 100 Mile Diet idea to simplify the process. Generally, goods and services that are produced locally are going to be less environmentally damaging than goods and services produced from afar, as less energy is expended getting them to the consumer. Even if all I do is buy my office supplies from a supplier in my local town, rather than driving to another town to purchase them, I've eliminated the amount of carbon emissions my vehicle would emit as I drove those extra miles. Consider how much more vehicle pollution I could erase by doing this all year long." While there are many laundry products such as detergents that claim to reduce environmental impacts, it is more important to learn better laundry habits in order to reduce your laundry footprint. Read tips: Here and here. Going green on laundry has a positive image that even some girl from Singapore named her blog GreenLaundry even though the blog has nothing to do with the title. 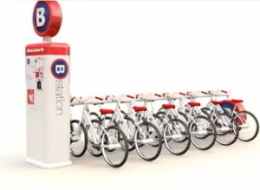 B-Cycle is a bicycle sharing service becoming available in major US cities including New York City and San Francisco. It aims to expand their business throughout the country.